Varied Sunday rides of 30/50 miles at a moderate pace. Tuesday evening pub rides – meet Ruxley Corner at 19:45. Contact – Margaret Tate (01622 752 008). Distance 12 – 16 miles, home by mid-afternoon. Rides Coordinators: Sunday – Stuart Orr (07967 271082). Brisk paced Sunday rides (100+ miles in summer) for the fitter rider. Adventurous, varied, often to places of special interest, with some impromptu off-road. Some weekends away. Moderately paced Sunday rides of 40-50 miles with a pub lunch. Meet 09:45 at Orpington Station. New riders always welcome. Steady paced, all day rides mainly on quieter roads, at times with ad hoc off road for general interest and/or routing convenience. Some midweek rides. N.B. lunch is carried. Meet 09:00 most Sundays at Rochester Castle Steps for rides from 40 to 80 miles. Moderate-paced Sunday rides of 30/40 miles, some car/train assisted. Lunch carried on all rides. Meet Tuesdays 19:30 at The Fox, Keston for short evening rides of 15/20 miles to a pub. Easy paced Saturday rides from 20 to 30 miles. We will welcome and look after you. Try us! 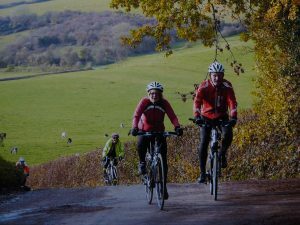 Rides of 40 to 80 miles at a pace to suit riders, weather and terrain. Meet Sundays 09:00 at Tonbridge Station for easy morning rides, 20-30 miles. Moderately paced rides of 50/65 miles once a month on Thursday for the reasonably fit rider. Pub lunches. Some car/train assisted rides. You don’t have to be a member to join a few introductory rides and it doesn’t cost you anything to come along. You will be made welcome and we will be pleased to see you. Newcomers are always welcome, we hope you will continue to ride with us and, if so, you will be expected to join Cycling UK. If you are unsure of your fitness, or find the thought of cycling daunting, try a short ride first. If in doubt, phone a contact. All rides are led by a person who knows or has researched the area, we ride as a group and no-one is left behind. We try to keep to the lanes and avoid the busier roads as much as possible. Lunch stops are usually at a country pub – bring sandwiches if you prefer. You are welcome to ride with as many groups as you wish.